With the Kansas Department of Commerce and Kansas Board of Regents recently awarding the Workforce AID project for Rubbermaid to Cowley College, three grant program trainees had an opportunity to tour the Rubbermaid facility in Winfield on Wednesday, February 24. Grant program trainees Steven Mashburn, Isaiah Mason, and Jim Yates were accompanied by Cowley College Mechatronics instructor Daniel Higdon and Carl Jewers, process engineer at Rubbermaid, for the tour. The trainees are being taught the following courses at Cowley College: Microcomputer Applications, Technical Math, OSHA 10, Industrial Technical Writing, Industry Practicum, Introduction to Mechatronics, Quality Control & Inspection, Workplace Ethics, and Basic Welding Processes. Cowley College instructors from Math, Business, and the Career and Technical Education Department have been working with Rubbermaid to provide nine weeks of intense training. Yates mentioned he is enjoying the hands-on classes and is eager to begin working for Rubbermaid. Joe Clasen, Cowley College Career and Technical Education Department Chair, and Stephani Johns-Hines, Associate vice president of business and industry advancement, met with the trainees prior to the tour. 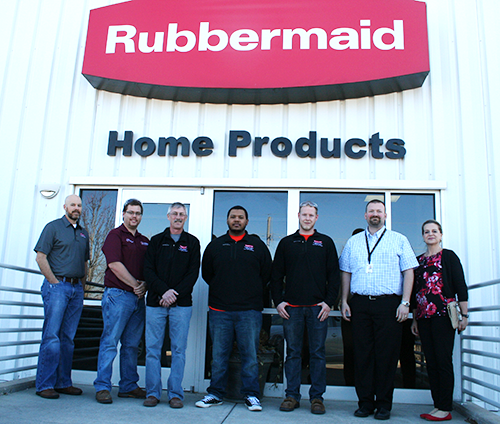 “The trainees have really meshed together well and are excited to come to work at Rubbermaid,” Clasen said. Johns-Hines praised the work being done by the trainees and is happy to have the opportunity to partner with Rubbermaid with the support of Cowley First to make this project possible. Those pictured are, from left, Carl Jewers, Daniel Higdon, Jim Yates, Isaiah Mason, Steven Mashburn, Joe Clasen, and Stephani Johns-Hines.